Warning: If you want to get any work done today, don't read this post. It will tempt you to spend your time surfing the net instead. 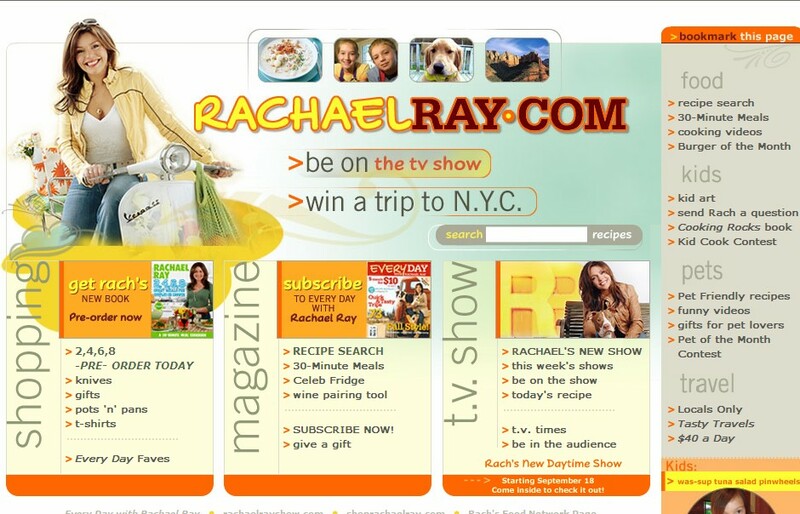 Since I obsessive-compulsively checked Rachael Ray's websites last week in anticipation of her new talk show debuting, I know that the changes made to them are new. Her main site, which previously had just one page with links to her talk show site, her food network site and her magazine site, now offers much more. All the links on the right go to a variety pages on all of her sites, so it's a great place to go to see the highlights of everything Rachael has in the works. And make sure you go enter all the contests! 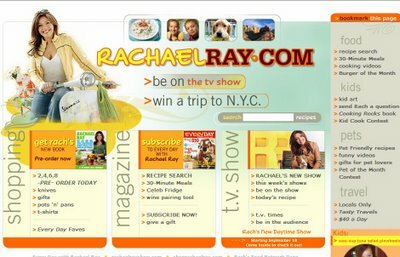 Rachael Ray's talk show website has also been given a face lift. What was once a simple flash site now has many layers of pages and a ton of useful information. My favorite thing about the new site? Definitely the grocery shopping list. You can print a list of ingredients for the meals made on the show. You can either get the list for the next day or download a week at a time. And, of course, I joined the RR Club. Not really sure what it is, but I joined! This site also has a great deal of timewasters, if you are in the mood. You can play games, take an interactive virtual set tour, and it looks like an interactive community is in the works. This site looks pretty cutting edge as far as creating a place for viewers to visit and create community. The Food Network clearly doesn't want to miss out on the opportunity to make a buck of Rachael Ray's new talk show, so they are featuring her on their main site. Clicking on the feature there takes you to a whole new page all about Rachael that includes an updated bio, a weekly schedule for her shows, recipe picks, a video gallery that includes a ton of great recipes, and a photo slideshow. When you see 'David Boreanz' listed ("Angel" from Buffy, now on "Bones"). That's my show. It's not listed yet. I hope we weren't left on the cutting room floor!! I love her new website. I want to try the thing where you buy the ingredients and make it with her.. hehehe. I am super slow though so we'll see if that would work? Have you done it yet? Jeny - Woah, whoah, whoah, Jeny. You were in the same building as Angel! I would have fainted. Carrie - I have not cooked all week! Way to busy at work to make it home at a reasonable time, so I haven't tried yet. Can you believe that no one ever thought of posting recipes like that so people could plan ahead? Although, I did email the webmaster there to ask that they put the serving size up with each ingredient list, to make it easier for me to make the recipes for two! The show with David B. will be on. Not clear when though. Soon i'm sure. Thanks, Anony. I will keep an eye out for it.